Some of the best engagement sessions include the family fur babies. It's very common for brides and grooms to ask that their pets be included into either the engagement photos, the wedding photos, or both. LMAC Photography always encourages brides and grooms to add elements to their photos that reflect their lives as a couple. The location is Rocky River Park located in Rocky River, Ohio. 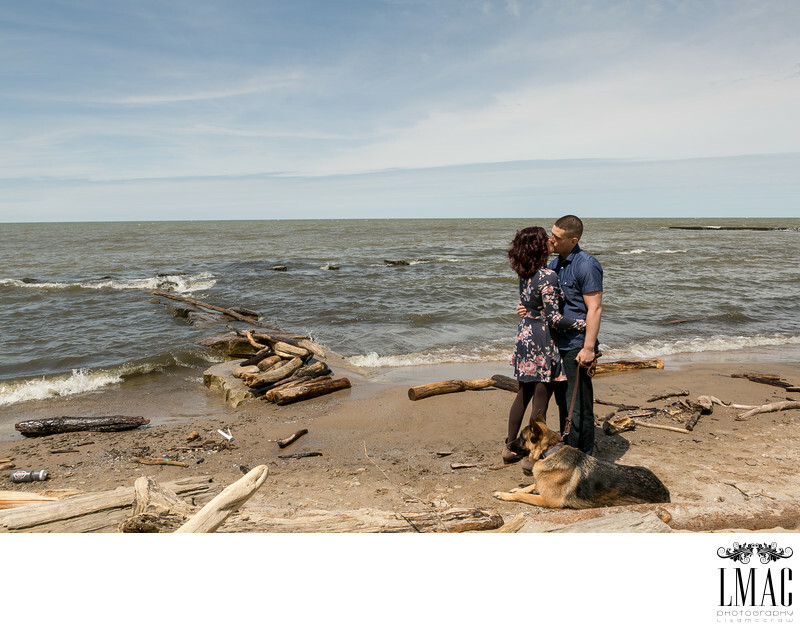 Rocky River Park is a natural Lake Eric beach west of Cleveland and is amazing for wedding photos. LMAC has photographed many bridal parties, bride and grooms, and engagement sessions at Rock River Park. This beautiful bride and groom selected Windows on the River in Cleveland, Ohio for their amazing wedding. Windows on the River is a common Cleveland Ohio venue and is the perfect venue for stunning wedding photography. Location: 20250 Beach Cliff Blvd, Rocky River, OH 44116.